RANGOON — As Burma’s President Thein Sein nears the end of his term, and amid an apparent pitch to portray himself as the architect of a successful reform agenda, questions have been raised about the true extent of his accomplishments. Since taking office in 2011 as the leader of a new quasi-civilian government following decades of military rule, Thein Sein has repeatedly pledged his commitment to prioritizing economic reform; a daunting task in a country where almost every sector had been mortally damaged by a corrupt and notorious regime. His first steps included major overhaul of key sectors: telecoms, car imports, finance and manufacturing. While it is clear that there have been enormous changes to all of these sectors in the past four years, experts say it’s misguided to give all credit to Thein Sein for a transformation that, frankly, had to happen. Just a few years ago, things couldn’t have gotten much worse; Burma was falling further and further behind its industrializing Asean neighbors. SIM cards, which were heavily controlled by the government’s communications enterprise, could cost up to US$1,500 at their peak. Since the introduction of two foreign telecoms providers—Norway’s Telenor and Ooredoo of Qatar—mobile access has spread like wildfire as SIM prices dove to about $1.50 in no time. A similar influx can be seen on the streets of Rangoon—much to the dismay of many residents—as the once vacant avenues are now packed with imported vehicles that used to be prohibitively expensive. After reworking Burma’s import policy nearly a dozen times, Thein Sein has made the country one of Japan’s biggest buyers in Asia. We have ATMs, foreign banks are entering the picture, a stock exchange is in the works. Burma now manufactures garments for American, European, Korean and other international companies. We brew a local brand of Heineken beer. But did the president do this, or was the Burmese economy so broken—and it’s people so poor and so keen to work—that it simply had nowhere to go but up? Maung Maung Lay, vice chairman of the Union of Myanmar Federation of Chambers of Commerce (UMFCCI), said the changes we see now, the glaring, obvious changes, don’t say much about the government’s performance, speaking instead to necessity. Maung Maung Lay said the government’s most effective move to speed things along has been the easing of trade restrictions and the removal of red tape for foreign partners. But despite the relative ease of entering Burma’s reform-era market, he warned, the country has yet to fully tackle corruption, crony capitalism and a mindset that is resistant to change. “The government’s main weakness is corruption, [that and] hesitance to take decisive action on certain reforms even when they have the will to change,” he said. Economic reform is a multifaceted task, and many factors in the overall reform process still need to be worked out to enable a stable economic environment that is investor friendly, said lawmaker Khine Maung Yi, an advocate for further labor reform efforts. While the adoption of a sector-wide minimum wage in September was a positive step, he said, it took a long time to implement and is still in a fledgling period wherein investors and workers are not fully in agreement about their rights and responsibilities. “That’s one reason why some foreign investors are still saying ‘wait and see’,” he said, emphasizing that while there are many major development projects underway to usher in new jobs and upgrade Burma’s manufacturing sector, those projects remain riddled with problems that people take very seriously, such as land loss and weak protections for laborers. Despite an apparent cooling down among potential investors due to uncertainty and stagnant legislation, a report published by the Asian Development Bank (ADB) earlier this year predicted continued economic growth resulting from Thein Sein’s reform program. The bank expected GDP growth to remain strong at about 8 percent over the next fiscal year, “stimulated by the ongoing reforms, an improved business environment, and the country’s integration into Southeast Asia,” according to ADB deputy country director Peter Brimble. Though inflation is expected to accelerate due to higher wages and increased domestic demand, consumer prices should ease slightly the following fiscal year, the report said. 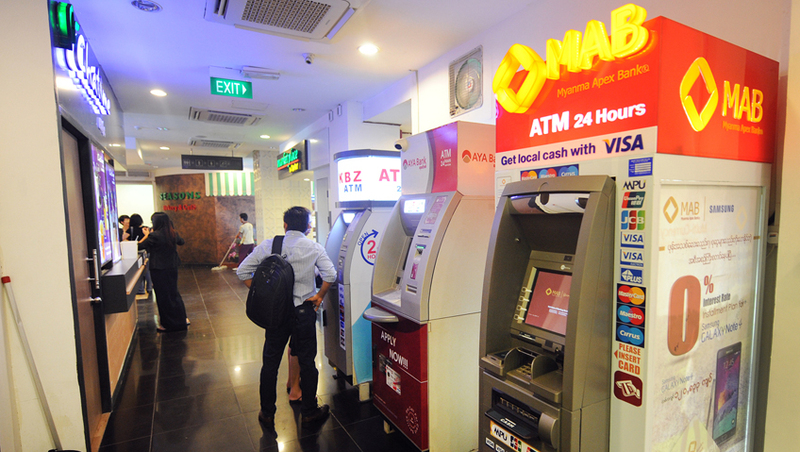 A row of ATMs at the Parkson shopping center in Rangoon. Whether those concerns will be taken into account in the future will depend largely on the outcome of the upcoming November general election. Thus far it seems that Thein Sein’s approach to economic reform dealt with immediate obstacles—bringing Burma up to date in terms of communications and banking. It is unclear, once those hurdles are fully cleared, what types of continued reform might be pursued by another Thein Sein administration, though some analysts have ventured to guess. Economist Sean Turnell, who has advised the opposition party, the National League for Democracy (NLD), said the chief economic achievement of the current government has been the mere act of incorporating economics into the political agenda at all. He went on to say however, that “there is also much failure here,” particularly in the government’s failure to pass key legislation on issues such as investment, companies, mining, arbitration and financial institutions. If Thein Sein were to get a second term, he said, we can expect to see “more of the same.” Of the administration’s failures, Turnell said, “above all – there has been little to no reform in agriculture,” which could be an indicator of how his administration might act if it keeps power. Top Photo - (JPaing / The Irrawaddy) Burma’s President Thein Sein at the Union Parliament on March 26, 2015.